Only HD Spy Camera, without electric toothbrush function. The use of this bathroom spy camera toothbrush is so convenient and effective. It has programmable settings enabling you to use its motion detection facilities to automatically start recording when the camera detects motion or simply use its start / stop continuous record function. The tiny but high definition digital spy camera hides inside the beautiful electric toothbrush. People think it is an ordinary electric toothbrush, but it has an unexpected function that is it can be a good spy camera. Because the tiny camera is built inside the exquisite toothbruth, no one can find the lens easily except the user. 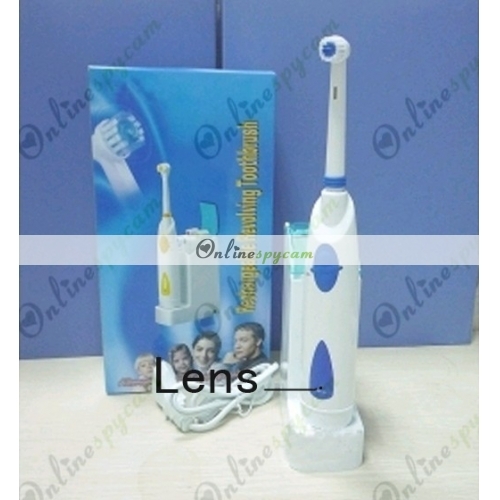 The user can use it to clean the teeth and record the videos secretly at the same time. Don't worry about the memory card or the battery. It does not need any external plug-in card, there is a memory card of 16GB built in itself and it can work last about 8-10 hours or above. That's enough for a wonderful video. If you hope to get the precious videos without anyone knows, this bathroom spy camera electric toothbrush is such a good choice. Best choice of CIA agents, police, detector, and spy agency.